FDDI is a premier Institute, serving as a ‘One stop solutions provider’ in footwear, leather and allied industry. Since its inception in 1986, FDDI has been playing a pivotal role in facilitating Indian industry by bridging skill gaps in the areas of footwear, leather, fashion, retail and management. FDDI has been functioning as an interface between the untapped talent and industry and its global counterparts, by fulfilling the demand of skilled man power with its specific curriculum, state of the art laboratories, world class infrastructure and experienced faculty. The Footwear Design and Development Institute Bill, 2017 was introduced by the ‎Minister of State (Independent Charge) for Commerce and Industry, Ms. Nirmala Sitharaman in Lok Sabha on March 14, 2017. 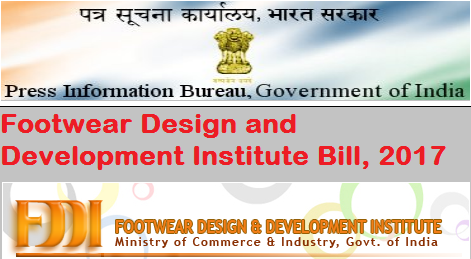 The Bill seeks to establish the Footwear Design and Development Institute as an institution of national importance. Currently, there are 12 campuses under the Institute. Functions of the Institute: The functions of the Institute include: (i) developing and conducting courses and research related to footwear and leather products’ design and development; (ii) granting degrees, diplomas and certifications; (iii) functioning as a national resource centre for curriculum development, training and skill development in the leather sector; and (iv) developing an international centre in the leather sector. The authorities of the Institute include: (i) a Governing Council, to supervise matters related to the institute; (ii) a Senate, as the principal academic body; and (iii) any other authorities as may be declared by the Governing Council. Governing Council: The responsibilities of the Governing Council include: (i) the administration of the Institute under the overall control of the central government, (ii) review of the acts of the Senate, and (iii) making academic appointments. The Bill also provides that the Governing Council shall not dispose of any property of the Institute without the approval of the central government. Composition of the Governing Council: The Governing Council constitutes 15 members including: (i) a Chairperson, who is an eminent academician, scientist, or industrialist from the leather sector, nominated by the central government; (ii) the Managing Director, who is an appointee of the central government; (iii) the joint secretaries in the ministries in the central government dealing with leather, retail or fashion sector and the Institute; (iv) a representative of the ministry in the central government dealing with skill development and entrepreneurship; and (v) nine professionals from the industry and academic institutes (e.g. the Council for Leather Exports and the National Institute of Design), nominated by the central government. Senate: The Senate is the principal academic body of the Institute, which specifies admission procedures, and academic content and calendar. It can make recommendations to the Governing Council regarding new courses, teaching and academic posts. Composition of the Senate: The Senate may include: (i) the Managing Director, as the Chairperson of the Senate, (ii) the Executive Directors of all Institute campuses; (iii) senior professors of the Institute; (iv) three external educationists and one alumnus nominated by the Chairperson; and (v) any others as may be appointed by the Governing Council. Funding: The central government can provide grants to the Institute to enable it to discharge its functions. The Institute will maintain a Fund, which will be credited with money received from central government, fees and other sources. Under the Bill, the central government may require setting up of an endowment fund or other funds by the Institute. Money from the Institute Fund may be transferred to an endowment fund or any other fund. Tribunal of Arbitration: Disputes regarding a contract between the Institute and any of its employees can be referred to a Tribunal of Arbitration. The Tribunal will consist of: (i) one member appointed by the Institute; (ii) one member appointed by the employee; and (iii) an umpire, appointed by the President of India who is the Visitor of the Institute. The decision taken by the Tribunal will be final and cannot be questioned in any court. The FDDI bill was passed by the Parliament in July 2017. The Provisions of FDDI Act 2017 have come into force from today, according to the Notification published in The Gazette of India on October 5, 2017.